We provide pre-project support to determine the needs of your project, develop budgets and be the liaison with regulatory organizations and insurance companies. NICET certified in-house designers with experience and training provide the best option for designing your fire protection system. Our ready and qualified staff of designers have the knowledge and capacity to provide a code-conforming sprinkler submittal package that prepares the project for an on-time installation. We have experience installing many types of fire protection systems and components, including: Wet systems, Dry Systems, Pre-action and Deluge Systems, CO2 Systems, and many Clean Agent Systems. We also install Underground Fire Mains, Fire Pumps and Water Tanks as necessary for full-service installations. Jackson Sprinkler works closely with a fabrication facility to assure quality control and on-time material deliveries. Well-trained fitters that have served a minimum five year apprenticeship and engage in continuing, on-going education are adept at making knowledgeable and efficient decisions in the field. Our trucks are well equipped with tools and supplies to get the job done. Our fitters work safely under the guidelines of MIOSHA. We have an outstanding EMR rating. 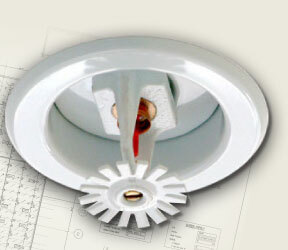 We offer a complete line of inspection, testing, and maintenance services for all types of sprinkler systems, special hazard systems, and fire pump tests.